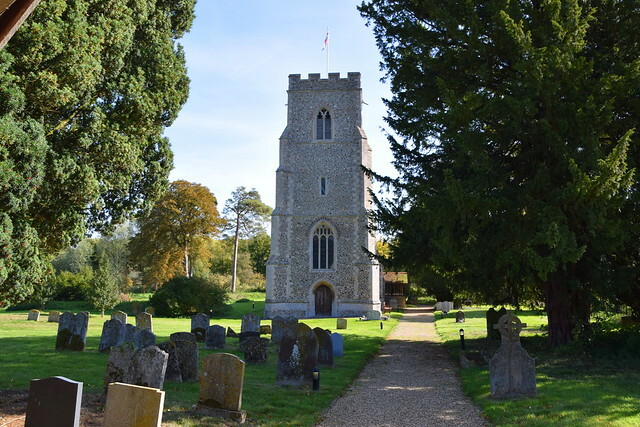 It had been years since I'd last visited Thorpe Morieux, seventeen of them in fact, which probably makes it my longest gap between visits to any Suffolk village or its church. Thorpe Morieux is not really on the way to anywhere, it is one of those lost, remote Suffolk villages in the hills between Stowmarket and Hadleigh, a good five miles from the nearest major road. It is not particularly quaint, or picturesque. It's a working village, surrounded by rolling farmland. This is one of the last places in Suffolk where you really cannot hear the hum of distant traffic. For the people who live here, Lavenham is the local big town, which says it all really. Morieux, pronounced M'-roo, was the name of one of the parish manors. This arrangement of the parish name is far more common in Essex, but something similar happened elsewhere in Suffolk at Stonham Aspal. 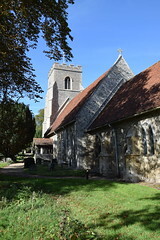 St Mary is a church that you always see for the first time across the fields. No matter from which way you approach, there it is in the green valley below. There is no village centre, and the walk up to the church is between cow fields, which seemed to me vaguely reminiscent of Yorkshire, an illusion helped by the surrounding hills. You approach from the west, and the elegant tower thrusts up beyond the lychgate. 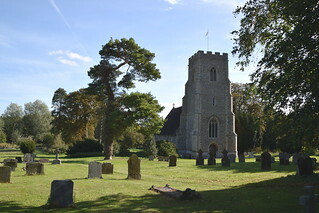 The church is hemmed in on the south side by the tightness of the churchyard which sprawls to the north and west, but in any case it is the fields around which provide the real setting. St Mary is a a good example of that moment where Dec is becoming Perp, everything in the right place, an archetypal village church. The wood and brick 15th century porch is simple and beautiful. You step down rather suddenly into the interior, and the nave falls away rapidly towards the east. Two spectacular sights await. The first is the grand transitional font. This is one of the few parts of Suffolk where Norman fonts are commonly found, and you can see how design had moved on in the century or so since the Norman font at nearby Great Bricett, for here we no longer have elaborate reliefs, but the style is increasingly elegant. In the decades to come, fonts would lose their squareness as well, but for now this one still broods magnificently. 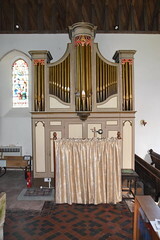 Beyond the font is more elegance, for the organ came from the Curzon chapel in Mayfair, and brightens up what can be a gloomy nave on a dull day. This is not to disparage the glass, of course, which is good of its kind, especially of the 20th and early 21st Centuries. 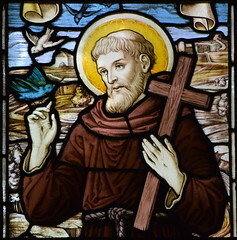 Most striking is Meg Lawrence's 2002 window depicting St Peter and St Paul in her now familiar style. 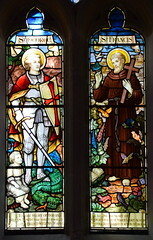 Nearby, the 1920s brought Arthur Moore's overly sentimental St George and St Francis, but note the small child seated at the foot of St George, appearing to play with the dragon as if it were a favoured pet. 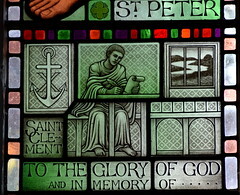 I wondered if it might be a portrait of the dedicatee, but in fact this is a WWI memorial window to two Temple brothers. Oddly, neither of them is on the war memorial. 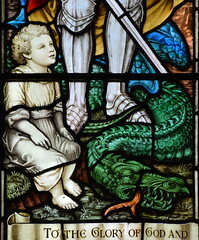 The east window of the previous century features glass by the O'Connor brothers, which has been partly reset in clear glass - did it come from elsewhere originally? The baby Jesus in the nativity scene is rather alarming, I'm afraid. 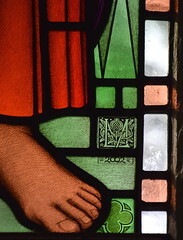 Some of the other glass may be by Burlison & Grylls, and I thought I detected the hand of William Wailes in one of the other windows, although none of these are signed. Most intriguing of all is a window in memory of the nine year old Louisa Temple, who died in 1877. 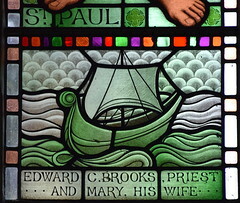 It shows her seated on the lap of Christ, and may be an early work by Ward & Hughes. There is an unusual image bracket set in the south wall, all vines and ivy. Mortlock thinks it 15th century, and not in its original location. 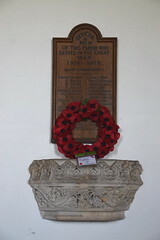 It seems to have been found and moved at the time of the 19th century restoration, and later made to form part of the war memorial. Probably it was beside the altar to St Nicholas, who Cautley says was the patron of a guild here in the years before the Reformation. 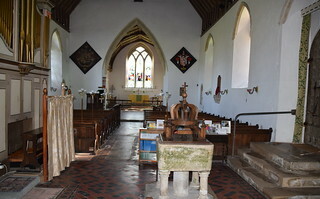 The chancel arch is flanked by two hatchments. Now, I'm not a great one for hatchments, but the one to the south of the arch is interesting because it is the latest in Suffolk, and one of the last in England. 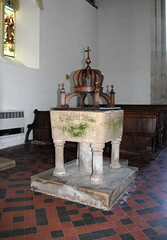 It dates from 1934, and is for one of the Warners of Thorpe Hall. Stepping into the large chancel, there are two fairly decent memorials to that ubiquitous family in this part of the world, the Fiskes. 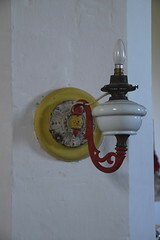 The better one, on the north wall, dates from the late 18th century. They are elegant and restrained, and not too imposing. The sill of the sanctuary south window opposite drops to show that there was a sedilia here once, but any remains of it have been lost. The 13th century angled piscina beside it survives, with an elegant column separating the two parts. Altogether then a handsome building, and well worth a visit, with its setting in the remote mid-Suffolk hills amid the now quiet farmyards which bustled in an earlier, busier age than today. Now, nothing very much at all seems to happen in Thorpe Morieux. Cycling onward up the steep lonely road towards Hitcham, I looked back into the valley, and saw the impressive Thorpe Hall rise like a moon behind St Mary.